Day 273 At sea on North Sea to home. The ferry crossing was smooth and uneventful. With my, by now, standard combination of gin and Stugeron, I slept like a baby. When I awoke, there was a soft pink glow on the horizon, visible through our cabin window. I couldn’t resist one last sunrise. I quickly showered and dressed, and dragged poor Howard from his bed. We went up on deck, and watched a magical sunrise in the east, looking back towards Europe. It seemed such a very apt way to be saying goodbye to the continent that we had been exploring for the past ten months. It was really hard not to well up inside. The sun shone on the drive back up to Fife from Newcastle through the glorious Borders countryside. We should have felt excited about being back in the UK, but perversely it was the sadness that our amazing adventure was over, that was the over-riding emotion. Arriving home, if I’m honest, was a bit of an anti-climax. It just felt really peculiar leaving Oscar on the drive and coming indoors. The house was cold, since both the boiler and the Aga had decided to malfunction simultaneously. So rather than arriving back to a cosy warm house, it felt like entering a cold room, one of the drawbacks of not running the heating for months. The first night back in our own bed was ridiculous. Neither of us could sleep – the bed felt so soft and saggy after the very firm upper bed in Oscar. We tossed and turned and fidgeted, and at one point, at about 3am, we did consider going outside to sleep in the van! We have now been home a few days, and are slowly acclimatising to all this space around us. The boiler and the Aga have been sorted, and the house is starting to feel more lived in again. I am savouring having a toilet and bathroom at hand, rather than walking across a cold field, especially in the middle of the night. It has been lovely starting to catch up with family and friends, not to mention Doctor Who and Strictly Cone Dancing! Our sons are pleased to have us home again, and we have already spent a lovely weekend with the two younger ones in Edinburgh. The really odd thing is, that already, the trip is starting to feel a little bit like a dream. Did we really travel to all those amazing places? Did we really travel 25,000 miles and visit 35 countries? So many amazing experiences. So many memories. We have been very lucky indeed to have had the opportunity to undertake such an incredible trip. For some, it would be a lifetime’s dream. For others, living in a small campervan for the best part of a year would be a nightmare! For us though, and I think I speak for Howard on this one too, it has been one of the best experiences of our lives. Already, ideas are going through my mind – different destinations, new adventures. I think it will be hard to settle after such an amazing trip, but who knows what the future holds? I hope that for those of you who have followed the blog, that you have enjoyed being armchair travellers. I have really appreciated all your comments and input over the months. You will realise that I am a huge advocate of travel. I really do think it broadens the mind, and leads to a better understanding of our fellow human beings. Europe is an amazing continent. It’s diversity must be greater than any other continent on earth. No other continent can possess the same number of incredible old buildings, and the same amount of history on offer. It’s natural wonders and beauty are beyond words. I hope that I may have inspired a few of you to get out there, and see some more of this wonderful continent that is just on our doorstep. For now though, I am signing off. Thank you for travelling with us … until next time, a bientot! Day 272 Amsterdam, Netherlands to somewhere in the North Sea. Our last day in mainland Europe didn’t really turn out as planned. We had imagined a day exploring the beautiful city of Amsterdam. Unfortunately though, overnight Howard came down with a rather spectacular dose of the ‘squits’. Whether it was something he had eaten, or picked up on one of the campsites we are not sure, but certainly it could not have been more timely to be spending a night in a hotel with an ensuite bathroom! It is the first time on the entire trip that either of us had suffered from any tummy upset, and the practicalities of dealing with such a problem in a campervan with no toilet or bathroom facilities became abundantly clear. Consequently, Howard was feeling rather washed out for our last day of sightseeing. We had planned a boat trip on the lovely canals, but decided that this would be imprudent, in view of events overnight. So instead, we just took a gentle wander around the canals, always within a safe distance from the hotel, just in case he needed to dash back to the room. Nevertheless, we spent a very pleasant few hours just pottering around. It was a beautiful autumn day in Amsterdam. The sun was shining, and the leaves were fluttering down from the trees into the canals below. We stopped a couple of times in cafes, Howard substituting our, by now, regular morning coffee fix, with peppermint tea, to settle his stomach. It is safe to say that we were both in quite a reflective mood, and had mixed feelings about returning to the UK. Our trip around Europe has been an absolute blast. We have been to so many places and seen so many things that it is almost impossible just now to assimilate. I’m sure we will reflect on it over the next few weeks, in order just to take it all in. For both of us, we have visited countries that we had never been to before. For me, Scandinavia was a first, and I absolutely loved it. Although Howard had visited all the Scandinavian countries through work over the years, he had never had the opportunity to explore them in the depth to which we were able to do on this trip. Eastern Europe for both of us was a first, and a real learning experience. Iceland was an adventure! The thrill of seeing the natural wonders of the extraordinary place were tempered with the challenges that the weather threw at us. Campervanning with a pop-up in such extreme windy conditions drove us to seek out alternate accommodation on many occasions. Discovering small micro-states such as Liechtenstein and San Marino has been enlightening too. Some of our fondest memories will be of the islands we have visited. There is something very special about islands, that gives them their own uniqueness – Sicily, Corsica, the Croatian Islands of Cres, Hvar and Korcula, the extraordinary Faroe Islands, and of course the amazing Lofoten Islands. All wonderful places. Other destinations we had been to before, but not for many years. We both loved our return to Venice, and will never forget the warm sultry evening we were sat having a glass of wine in St. Marks Square, when our eldest FaceTimed us to tell us that he had just got engaged – just magic! The Greece is somewhere we had travelled to in our youth, back-packing around the islands. This time, we visited the northern mainland, and were blown away with it’s beauty. Returning to Prague and Dubrovnik were an absolute joy. We have been introduced to so many cities for the first time – San Sebastian, Santiago de Compostela, Porto, Lisbon, Seville, Cordoba, Rome, Palermo, Matera, Piran, Copenhagen, Oslo, Stockholm, Helsinki, Talinn, Riga, Vilnius, Krakow – the list goes on and on. All have been amazing in their individual ways. We have seen so much history. Magnificent amphitheatres in Rome and Sicily, Roman temples in Agrigento, Sicily, troglodyte dwellings in Puglia and Matera, prehistoric rock carvings in Arctic Norway, standing stones in Corsica, so many churches, cathedrals and mosques I could never count! I have learnt so much European history along the way, and have a much better understanding of what makes this continent tick. For me, the natural wonders have been my highlights. Although I have loved seeing all these cities, it is really nature that rocks my boat. I adore mountains, and we have seen these in abundance – early on in the trip, the Picos de Europe in northern Spain and the Sierra D’Estrala in Portugal, and the wonderful Sierra Nevada in Southern Spain. Then there were the magnificent Julian Alps in Slovenia, the Dolomites in Austria, the Alps in France, Switzerland, Liechtenstein and Italy, the Tatras mountains in Slovakia, and the utterly stunning mountain ranges in Iceland and Norway. Then there were the fjords – so many fjords, all absolutely breathtaking. The Norwegian fjords, of course, but for me, the Eastern Fjords in Iceland were an absolute highlight. Then there were the coasts – the rugged north coast of Galicia, the classic Amalfi, the vibrant azure waters of Croatia, Greece and Corsica, the barren Arctic coast in Iceland, and the stunning rocky cliffs of Nordkapp, to name but a few. To name a favourite amongst all of these would be impossible. We have loved them all, and each has it’s own very special character and uniqueness. Much of this trip was not just about seeing new (and old) places. It was about experiencing different cultures, and above all, about meeting different people. Throughout Europe, we have been universally welcomed in every country. It has been an absolute delight to have met so many kind and helpful people along the way. I think in the entire year, there are literally only a couple of occasions when we have been met with any rudeness, and on each of these, it has been some bureaucratic official with a clipboard in hand, probably on a bit of a power kick. The people we have met throughout Europe have been genuinely warm-hearted, and incredibly gracious towards us as visitors. I look back to an absolutely freezing cold morning in Iceland, when Howard and I sought refuge in a coffee shop in a remote village in the Eastern Fjords – definitely the only visitors in town, as we had the whole campsite to ourselves, and there were no guest houses, let alone hotels. The two elderly ladies sat in the corner, knitting, asked us of our plans. ‘Going south’, we said. They both consulted with each other, and then the Icelandic met forecast, and told us, shaking their heads, ’No, don’t do that’. They promptly sent us up to the swimming pool, which doubled up as a ‘tourist information office’, which really meant that the man at the desk at the swimming pool would also help the occasional tourist who passed through. Within half an hour, armed with maps and campsite suggestions, we were driving round Iceland in completely the different direction to which we had intended, avoiding a massive low front which plagued southern Iceland for most of the following week. It is simple acts of kindness, like this, that we will remember most. How can we ever forget the lovely Danish couple, Birtha and Neils, who met us for ten minutes in a campsite in Seville, and invited us to stay with them when we reached Denmark. Who would do that in the UK?! Of course, one of the hardest things about this trip has been leaving family and friends behind. It is something, for me, that was going to be one of the biggest challenges of this adventure. I needn’t have feared. Almost on a daily basis, some of my lovely friends have What’s Apped me, day and sometimes even night (you know who you are!). Our children have been perhaps less attentive, and despite starting this blog really for them, they have periodically phoned up to ask, ‘Where are you now, then?” All three though have been out to visit us, Edward to Croatia, Thomas (and Katy, his fiancee) to Iceland, and Oliver to Norway, which has been lovely. Oliver probably thought he had pulled the short straw, when we announced when we picked him up at Tromso airport, that he was doing a long road trip with the ‘rents’ to Nordkapp, the most northerly part of mainland Arctic Norway. It turned out to be a definite trip highlight, managing to bag the most uncharacteristically splendid weather window, and seeing Arctic Norway at it’s magnificent best. He even managed to join ‘The Royal and Ancient Polar Bear Society’, and sleep in a flimsy pop-up tent in the most northerly campsite in mainland Europe! More recently, we have met up with other friends and relatives. Howard’s brother and his wife came out to join us in Corsica, and we met up with other friends in Tuscany and Corsica, which was lovely. When we set off on this adventure, Howard and I had absolutely no idea how well we would cope together in our tiny little van. In fact, it has been wonderful, I can honestly say that. We have both loved each others company, and bar one incident where Howard lost me on a ferry, barely a cross word has been spoken. Living and sleeping in our lovely little VW has been joyous. There is something very magical about sleeping ‘up top’ in a Cali – comfortable and cocooned, but being very aware of the nature around you. Waking up to magnificent scenery out of your ‘bedroom’ window is a privilege, and lying in bed at night listening to lapping waves, cicadas clicking, owls hooting or even winds howling is a very special experience indeed. I am going to miss all of this, and going home is going to feel very strange, I suspect. For tonight, though, we have one last ferry crossing from Amsterdam into Newcastle. Boarding the ferry this time, was uncharacteristically painless. We arrived early, and were almost immediately beckoned onboard, by helpful staff, who greeted us warmly. ‘What’s going on here then?’, we thought. Grimaldi should take us lesson from this bunch. Customer service extraordinaire. So as I type, Howard is sending up the zeds, exhausted from his spell unwell. Before we retired for the night, we sat on the deck, reflecting on the trip. Already we have itchy feet, and we haven’t even got home yet. Perhaps a trip around the UK beckons, who knows?! One thing, for sure, is that the star of this entire adventure, is a little blue Cali called Oscar. 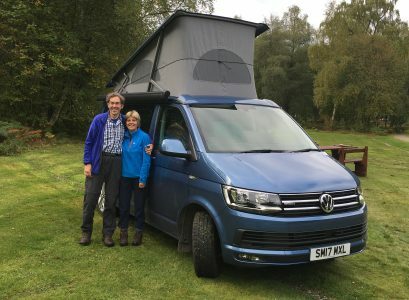 He has done us well, climbing up mountain hairpins, negotiating the snowy roads on the NC500 in Scotland, squeezing into tiny car parks and spaces no other campervan could, driving us over 24,000 miles in 35 countries, and providing us with a warm and comfortable space to live in. Latterly, we have even started to refer to him as ‘home’, and Howard had taken to checking on him last thing at night, if we are staying in a hotel or guest house. So before I get weepy-eyed, I will just say one thing. ‘Three cheers for Oscar!!!”. Day 271 Cadzand, Zealand to Amsterdam, Netherlands. Today we awoke to a definite chill in the air, despite the forecast predicting a sunny day. Even after my hot shower, it took me a full hour to dispense with the goosebumps I had woken up with. There was only one other set of campers on our site, on the far side of the grassy field, so we had the luxury of having the wash blocks essentially to ourselves. I had been woken this morning by the sound of geese, and thought that perhaps some migrating geese had landed on the lush green grassy site. However, as we sat drinking our morning tea, the culprits of the noise revealed themselves. A group of six lovely white geese paraded across the path in front of us, and proceeded to walk into the orchard, and feast on windfall apples – they were in goosey heaven! Packing up the van, everything was damp. There was condensation on the topper, and despite leaving it out to dry over the chairs, in the end, we had to pack it away still wet. There is something though about flat places, that does something special to the light. Just as in the wide flat expanses of Suffolk and Norfolk, the skies here in Zealand have a special quality – more luminant than further inland. Zealand is made up of a series of islands, joined by bridges and tunnels. We decided to plot a route through this coastal part of the Netherlands, on our way to Amsterdam. For our morning coffee destination, we picked the medieval town of Middelburg. It’s cobbled alleyways harp back to the sea-trading days of the 16th century, with many of the street names reflecting it’s past -‘Beer Dock’, ‘Grain Dyke’ and ‘Timber Dock’. The town sits on a bend in the River Arne, close to the windswept coast. The main square is quite spectacular – huge, with the impressive town hall buildings, the Stadius, taking up one entire side. We found a charming little coffee shop, and sat in the sun and enjoyed the world passing us by, very pleasant indeed. Before leaving, we had a look at one of the three Abbey Churches, and stuck our head in a couple of shops, searching out a flag. The latter drew a blank, but we were surprised to learn that the Dutch flag is, in fact, red, white and blue, and not orange as we had expected. The orange colour, so much associated with the Netherlands, derives from William of Orange apparently. Our next stop was the charming little town of Veere, a short distance away. This maritime town, that sits on the Veerse Meer, owes it fames to it’s association with Scotland. In 1444, the Lord of Veere, Wolfert IV van Borssele, married Mary, daughter of James 1st of Scotland. As part of the dowry, van Borssele was granted a monopoly on trade with Scottish wool merchants. So, after looking around the pretty harbour, we couldn’t resist taking a peek at the ‘Scotze-Huisen’ or Scottish House, two merchant’s buildings, dating from the 16th century. The small museum had a shop, and I went in to to ask if they could sell me a Netherlands flag. The answer was ‘No – only a Saltire’! It certainly was a fine town, although apparently it’s wealth diminished with the decline of the cloth industry. Finally, it was time to leave Zealand, and make our way to Amsterdam. It is maybe somewhere we might return to another time – it seems like a cyclist’s heaven – no hills and tons of cycle lanes. In fact, the biggest danger in Zealand in avoiding the multitude of bicycles. I did feel moderately guilty for not at least getting out our bikes, but sadly we know have a schedule to stick to, since we have booked our ferry back to Scotland. Another trip, perhaps. The drive into Amsterdam became increasingly tedious, as the traffic levels increased. To make matters worse, Boris went into ‘stupid mode’, and went into long periods of silence, when we needed him most. Certainly not matching up to his namesake! Eventually we arrived in the city, and found our hotel, in the canal district. It was a tight squeeze parking Oscar, but he is tucked up fine in the courtyard of the hotel. We wasted no time in getting out to see this wonderful city. The overwhelming thing about Amsterdam is…..Yikes! So many bikes!!! Everywhere you turn they are coming at you, from all directions. Bicycles are clearly the main form of transport in this city – there are literally thousands and thousands of them. The whole city is cycle friendly, with cycle lanes on every road, and they appear to have more space on the walkways than pedestrians. Don’t get me wrong – I applaud this as a means of transport. It also must mean that Amsterdamers (is that right?) must be some of the most fittest city dwellers, with all this daily exercise. But the thing is, after spending the afternoon and evening walking around this amazing city, I appear to have developed an irrational fear of bicycles! They speed around the place with complete disregard for pedestrians, and I have no doubt, must be a major cause of admissions to A & E. Howard ended up having to hold my hand, whenever we tired to cross a road. Cyclists apart, we had a lovely time exploring the city. The canal area is just charming, then as we you got nearer to the Central Station and the Old Town, the character started to change. The rather overwhelming pungent smell of cannabis started to pervade the air, and a number of ‘Coffee Shops’ snd shops clearly selling pots of the weed became evident. At the Central Station, the number of bikes chained up was quite extraordinary. How the commuters ever find their own bike at the end of the day is beyond me! We took a free ferry along the river to the other side of he city, just because we could. By now, the sun was setting, and the city took on a very different feel. We walked back towards the canal area, and found a lovely cafe for our evening meal. It felt quite sad, since this will be our last whole day in mainland Europe, before we catch the ferry back to the UK tomorrow evening. Consequently, there will be no blog tomorrow night, as we will be at sea. We plan to touch base back in Scotland, before deciding if we have the stamina for one final flush around the UK. We will see?! Day 269 Metz, Moselle, France to Esch-sur-Sure, Luxembourg. We awoke to a misty morning, such that we could barely see the bank on the other side of the Moselle River. However, within an hour of first light, the sun slowly started to burn away the mist. Wisps of mist slowly rose from the water, giving the whole scene a very ephemeral feel. A grandfather and his grandson stood on the river bank twenty yards or so away from us, fishing. Within just a few minutes, they were hauling out the most enormous fish into their net. It was possibly a pike, we couldn’t tell from our distance. However, after admiring it and showing it to the other fishermen, it was duly returned to the river. Fishing always seems a bit of a pointless activity, to me, if you are just going to throw your catch back, but each to their own. I read in the Lonely Planet that ‘Pike in Green Sauce’ is one of their favourite dishes in Luxembourg – sounds revolting, and I made a mental note to avoid the fish as we travel on to our next destination! After breakfast, we packed away, and thanked the lady owner profusely for such a lovely pitch. We had been warned by a couple walking their dog by the campsite, as we struggled to open the entrance gate to the campsite the night before, that the proprietor had a fierce reputation. Consequently, on check in, we had been politeness personified, which clearly paid off, and resulted in us being such a prime spot by the river. A French couple that followed us in, driving a Big White, appeared to get the sharp side of her tongue. My understanding of French is not good enough to understand what they had said to her, but they got send to the end of the campsite, with no view. Mindful of this, we made a point of thanking the lady again, and I received a huge hug, and was invited to come back again. A bit like the Cybil Fawlty of campsites, I suspect! From our campsite last night, we had spotted a castle, sat high on the hill, a little along the river bank. Consequently, we couldn’t resist popping along to the local village to take a look. It turned out that this was the ‘Chateau des Ducs de Lorraine’ (Castle of the Dukes of Lorraine), built around the 13th century. In the town was the Old Clock Tower from 1294, which housed a cell, where apparently in 1619 , a ’witch’ called Alicon Bartholomy was imprisoned, before being burnt to death, for the crime of poisoning through witchery spells. I must say, that the whole town looked a little dilapidated, after the pristine town of Ribeauville yesterday, but maybe more authentic perhaps. It was only a short fifteen minute drive and we found ourselves crossing over the border into Luxembourg. Initial impressions of the country were rather underwhelming. After the stunning scenery in the Alsace yesterday, with it’s wonderful medieval towns, we suddenly found ourselves driving through flat arable farmland and rather ordinary looking towns, with rather characterless buildings. Frankly, we could have been driving through the back end of Cranleigh (no offence meant to my friends who live in Cranleigh!). We made our way into the capital, Luxembourg City. Luckily, we found ourselves a parking space next to the Square of Liberation, and set off for a wander. The city basically sits on two levels, with the old town high up on the hill, and the newer city down below, around the banks of the River Alzette. An elevator is provided for those who do not wish to climb either up or down. We grabbed a coffee in a pretty pedestrianised street in the old part of town, and then set of to explore. We took a look inside the Notre Dame Cathedral, and then followed paved lanes to the Palace Grand-Ducal, the winter residence of the Luxembourg royals. In the square opposite the palace is the building of the Luxembourg Parliament – an elegant building, but pretty small. It reminded me of a Rowan Atkinson song that we used to listen to as students, called ‘Do Bears?” In it, there are the lines, ‘Is the Pope Catholic? Is Luxembourg small? And do hairy bears sha-la-la-la in the woods?’ It always used to make us laugh, and for some reason these lyrics came to mind, as I considered how small the parliament building was. I’m guessing though, that only those of us of a certain age, will have the slightest idea of the song I’m talking about. Howard has just You-Tubed it, and is sitting opposite me as I type in utter hysterics!! We then found a lovely walkway around what was left of the ramparts, which gave us a birds-eye view of the city below. On the way back to Oscar, we passed by the ‘Maison de l’Union Europeenne’, an information centre about the EU. Inside the lobby were all the flags of the EU lined up. I must say, I found it ironic that it was the Union Jack that sat proudly next to the flag of the EU. Howard insisting on posing next to the two adjacent flags – maybe a historical shot in the future? I must say, that I warmed to Luxembourg City as we walked around it. The old historical centre was quite charming, and the whole place was vibrant and buzzing. Tour completed, we headed out of town and into the country again. We headed to a place called Esch-sur-Sure – a hamlet on the banks of the River Sure, that sounded interesting. As we were approaching, we luckily spotted a lovely campsite down by the river, just half a kilometre short of Esh. We had originally sourced another camping ground about half an hour north, but this one looked so nice that we just drove in and checked in. Of all the campsites that we have stayed in, this one had to have the least bureaucracy of them all. In some campsites, we have been asked to deposit two passports, fill in multiple forms with name, age, DOB, car registration, home address, camping card number, home and mobile phone numbers – it goes on and on. Here, the lady just took 17 euros and the deal was done, and told us to go and pick our own place. We quickly set up, and then took the lovely little riverside walk into Esch-sur-Sure. It is a gem of a place. Old, quaint, set on a steep hill, with a beautiful church and a fort at the top of the hill. We climbed up the narrow cobbled street, and then took a stone path up to the fort. At the top, we had magnificent views back over the town, and along the river to where our campsite sat. My initial impressions of Luxembourg were swept away – this place has character in shed-loads. We climbed back down the hill, and rewarded ourselves with a drink on the terrace of a bar, popular with bikers. It would have been a peaceful spot, overlooking the oxbow bend in the river, had it not been for the bikers, constantly revving their engines whenever one of them left. Why do they do that revving thing?!! We then made our way back to the campsite, and reflected on our day over tea. Our expectations of this place were, I admit, not high. However, we have been proved wrong. Luxembourg may indeed be small, but there are some rather charming places here, if you take the time to find them. I fear, though, I will go to sleep tonight, with the Rowan Atkinson song ringing in my ears. ‘And do hairy bears sha-la-la-la-la in the woods…’!!!! Day 268 Colmar, Alsace to Metz, Moselle, France. We woke up to sunshine in the Alsace, and were quick to pack up and leave our view of the concrete wall. Within minutes, we were in beautiful countryside, vineyards in all directions. We found ourselves driving on ‘Route des Vins D’Alsace’, on roads meandering through the vineyards, intermittently passing through gorgeous little villages and towns. We came to one town called Bennwihr, where we stopped to take a photo of the church, with it’s unusual tiled roof. Adjacent to the church, was a memorial for those who died in the first and second word wars. Interestingly, there was also a plaque in memory of the 71 young men from the town who had been conscripted into Hitler’s Third Reich in the Second World War. Having been returned to France following WW1, Alsace was annexed by the Germans during WW2, and in total 140,000 Alsations were forcibly conscripted into Hitler’s armies. These men were known as the ‘Malgre-Nous’ – literally ‘Despite Ourselves’, since the majority went to war against their will. This is one of he reasons that Strasbourg, in the Alsace, was chosen as the seat of the Council of Europe, and later as the home of the European Parliament – as a symbol of hope of future Franco-German, and pan-European cooperation. After WW2, Alsace was once more returned to France, but throughout the region, the influence form Germany remains, both in architecture, and place names. Today, Alsace has a unique character from the rest of France. Many of the towns wouldn’t look out of place in a fairy-tale, and the scenery is sublime, with undulating hills covered in vines, and many topped with castles. The region, as well as being famous for it’s wine, also is a gastronomes treat, with a profusion of Michelin starred restaurants, and every town bulging with charcuteries, patisseries and shops selling traditional fare such as preserves and it’s Munster soft cheese. Alsace is also known for it’s storks, more than 400 pairs, and everywhere you look, there are storks nests. Howard spotted one wandering amongst the tents on last night’s campsite, and many of the buildings, particularly churches, have a large nest of twigs and branches sat aloft. We eventually made our way to a lovely little town called Ribeauville, where we spent several hours, pottering around, and of course, having our statutory coffee. This medieval town is just so pretty, with it’s coloured timber buildings and cobbled lanes, with glimpses all around through gaps in the houses to the the vineyards beyond. We climbed the hill, through an old stone arch to the ‘Picturesque Quarter’ – if anything, an understatement! The whole town was beautifully kept, and nearly every house had a profusion of flowers tumbling over window-boxes. Occasionally, we stumbled across little squares, with fountains, and restaurants and cafes on every corner. This place is stunning, and it knows it! I can’t believe that I had never even heard of it, before today. We stopped to buy some bread and quiche for our lunch, and then I spied a shop that caught my eye. It was selling brightly coloured jackets, made from a patchwork of different fabrics. I couldn’t resist going inside and trying one on. It looked like something a hippy might wear, not out of place in ‘Woodstock’, but when I tried it on, I immediately thought it would make the perfect ‘campervan’ jacket. Even Howard liked it, so it was a done deal. We slowly wound our way back to Oscar, and only then did we decide where to go next. By now it was 2.30, and we carefully selected a campsite near Nancy that sounded nice. However, not long after setting off, as I sat reading the details, I realised that it had closed 2 days earlier. So we rapidly had another change of plan, and headed for to a campsite just beyond Metz. The campsite is situated on the banks of the Moselle River. Ironically, having started the day on the ‘Route des Vins D’Alsace’, we finished the day on the ‘Route des Vins de Moselle’. It makes us sound like vinos! The contrast in tonight’s pitch from last night’s couldn’t be more striking. As we arrived, the lady asked us if we would like a river-side spot. As we drove into it, the sun was just starting to set, sending a wonderful orange glow across the river, highlighting the autumnal colours of the trees on the bank opposite, and reflecting in the water – just stunning. Tomorrow we head the short distance to Luxembourg. For tonight though, it would seem wrong not to drink a glass of wine, to celebrate the Alsace and Moselle regions. Cheers!! Day 267 Jungfrau, Switzerland to Colmar, Alsace, France. Today, we left our lovely campsite in the Jungfrau, and moved further northwards, back into France. The drive initially was through the glorious Jungfrau valley, but quickly we were onto motorways, and the driving became tedious. We plodded on, shortly diverting into Germany, before arriving in the Alsace. Many of the place names had German sounding names, despite being back into France. Of course, as Howard pointed out, Alsace used to be part of Germany, prior to WW1. We headed to the beautiful medieval town of Colmar, capital of the Alsace wine region. It was like stepping into a film set in the middle of the 15th century. The Old Town is a profusion of stunning medieval timbered buildings, painted in different hues of pastel pinks, ochre, blue and greens. Through the old town runs a canal, with low stone bridges, such that it has been named ‘petite Venise’. The cobbled streets lead to pretty squares, some with fountains and statues – all very elegant. Many of the streets are named after the tradesmen who used to work here. So there is La Rue de la Poissoinerie, (the street of fishmongers), the Rue des Boulangers (bakers) and the Rue Des Tanneurs (tanners, for those not familiar with French). There seemed to be a profusion of food shops, either charcuteries, selling the various meats and sausages, several chocolatiers, and some lovely cake shops. We stopped in a square by one of the stone bridges, and had a late coffee and a bite to eat. Next to the restaurant was a small wooden jetty, from which half hour boat trips were departing from. I say boat, but they were really electrified punts, sitting incredibly low in the water. Howard and I can’t resist a boat trip, so we purchased our tickets, and spent a pleasant thirty minutes touring the canals. The only problem was our helmsman, a young, rather full of himself Frenchman, who took great delight in persistently rocking the boat, to scare the tourists. Once might have been amusing, but half an hour of this nauseous rocking became rather tedious. I suspect, that if the Koreans in the boat had stopped shrieking every time he did it, he would have soon stopped his antics. I wouldn’t have minded, but the life jackets were left sat on the bow – pretty useless if actually needed. Boat trip completed, we had a wander around this stunning old town. The area around the Old Tanners quarter was especially picturesque, and the Cathedral made from a warm ochre stone, with some interesting green tiles on part of it’s roof, held centre stage. Tour complete, we returned to Oscar, and headed to our campsite for the night. Howard had rejected the campsite nearest to town because of it’s poor reviews. Instead, we came about ten kilometres out of Colmar, to a campsite in the shadow of a hillside covered in vineyards. Sounds nice, I hear you say? Wrong. It is shite! Since we are only staying one night, the French receptionist has given us the smallest, noisiest pitch on the site. It is adjacent to a bend in the road, so cars rev and change down gear right by us, and we are looking out at a concrete wall. It is unquestionably the furthest pitch from the wash-blocks, at least a five minute walk (in fact, 5 minutes 30 seconds – I timed it). Personally, I would have moved site, but Howard is tired from driving, and uncharacteristically ‘didn’t want to cause a fuss’. Strange, since earlier today we was full of gusto, as he shouted at a Swiss driver who cut him up on the motorway, some combination of the words ‘arse, stick it up’ and ‘hole close over’, if my memory serves me correctly! Tomorrow we will be leaving early, and hopefully we can find a more picturesque site to stay the night. I’m sure Alsace is beautiful, just not where we have ended up tonight. At least my anger at leaving the EU is being tempered a little, if this is the best the French can offer us! Limited photos since – you guessed it – their WiFi doesn’t work either!